FREE SHIPPING in the USA & Europe. Finally someone came up with a basic music theory book that's actually understandable and readable. Mr. Harnum explains complicated concepts in a way that even someone like me without any music background can easily understand them. I am looking forward to playing an instrument thanks to his help. This is by far the best music theory book I have ever read! Format: PaperbackVerified PurchaseBasic Music Theory by Jonathan Harnum, is an excellent book for people of all levels. Whether you are a beginner, or learned musician, this book is a very comprehensive source of material, that is both accessible,easy to read & understand, and very enjoyable. I have played various instruments over 24 years.And because of Harnum's matter of fact, conversational tone, this book has lent more to my understanding of basic music theory than all my private insturctors combined. Learning music theory on your own is not something to be tried by the faint of heart, simply because it seems like that for every rule there are fifty million execptions. Sorta like the English language. hmmmm... Anywho, Jonathan Harnum has taken an overly complicated subject matter and made it learnable for anyone. And I do mean anyone!! As he explains early in the book, previous music theory books really lack in completely explaining WHY things are the way they are. Harnum de-cryptifies all that is involved with music theory for the non-musician. But this book is not just for the non-musician! I have been a student of music for over 13 years and a teacher for 3 and I found myself finding new and interesting (and humorous) facts about music theory. This book can teach anyone music theory and keep a smile on their face the entire time. In Basic Music Theory: How To Read, Write, And Understand Written Music, Jonathan Harnum draws upon more than ten years of experience and expertise as a music teacher to present the non-specialist general reader with a definitive and accessible introduction to music theory. At the end of each short chapter a review has been placed to insure that the reader has understood and assimilated the informative provided. Also provided at the conclusion of each chapter is a "practical use" exercise. At the the end of each major section or "Part" is a comprehensive review (complete with cross-referencing to the page number on which the information first appears). After every few chapters and covering other topics are "interludes" ranging from ultra-brief history of musical notation, how to practice, conducting, and a lesson in Italian musical terms. 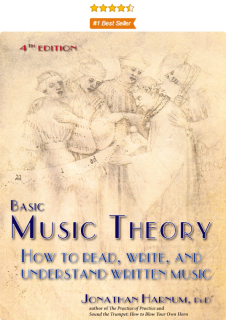 Basic Music Theory is an ideal and highly recommended text for anyone of any background wanting to become proficient in the reading, composing, and performance of written and notated music. The author of this book obviously had those of us who are scared of the complexity of music theory in mind when he wrote this book. Basic Music Theory is a down to earth book that moves gently through the landscape of music theory from the layout of the staff to chords and their inversions. The author also has interludes on practicing and conducting among others. 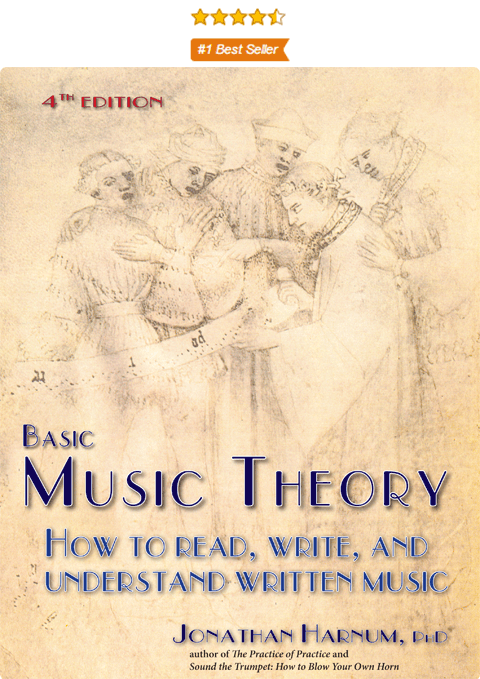 I highly recommend this book if you want to understand music theory whether to compose music or to play it better.